Despite the rain aaaaaaaaaaaaallll day Wednesday, Thursday, and Friday, it was sunny and on the warm side of cool Saturday. Over 150 people (big and small) gathered in the Trenthem's lush backyard to enjoy an afternoon of music, crafts, conversation, healthy snacks, and beer on tap. The kids came out full force in their costumes and took over the haunted playhouse, painted gourds and pumpkins, climbed trees, and did their best to destroy the new, improved banging wall. Dr. Dave Evans, joined on stage by his very talented three-year-old grandson, gave the under ten set their first taste of old time blues. And before we knew it, it was last call. Chess Club closed the show with a Pop Noir bang. We can hardly wait for next Spring to start romping again. We hope to have more shows and more bands next year. Please let us know if you are in a band and want to play, if you have a big yard and want to host, what bands you'd like to see, and what kind of beer you like! Leave a comment here, or email us at memphisrocknromp@gmail.com. For more pictures, visit our Flickr page. And for a special treat, check out a You Tube video of Rock-n-Romp founder, Debbie Lee, at the DC Halloween show. The October 28th show is the last one this year. If you haven't made it to one of our super-fun shows, this is your last chance! 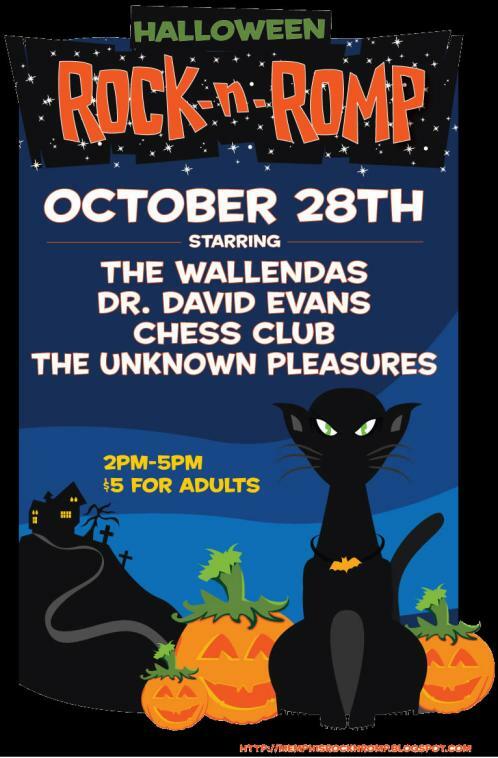 Let the kids dress up, bring a *healthy* snack to share, and enjoy some great music! Unknown Pleasures DJs - all the quiet parts in between. Evites/emails will be going out the week of October 9th. To add your name to the list email memphisrocknromp@gmail.com.